So you have a long list of cost reduction goals ahead of you in a variety of spend categories. It makes sense as a procurement professional you want to dive right in. Not so fast. Before undergoing strategic sourcing projects, it is crucial to take the necessary steps to prepare your team for efficient processes and avoid common potential set backs. With 25 years of experience, we've learned a thing or about how to approach cost reduction initiatives that can set up sourcing initiatives up for success from the beginning. While it might seem natural to jump right into the wave of sourcing events, you'll want to start by ensuring all parties are aligned with the goals and strategy ahead, identify the individual responsibilities and roles of everyone involved, and gain necessary feedback before heading in the wrong direction. While discussing strategy, predictable roadblocks, and goals are common for the initial call, this conversation will also allow you to validate information and data with incumbent suppliers to develop a complete understanding of the relationship. What else should you keep in mind before launching a wave of sourcing events? Find out in our latest infographic! 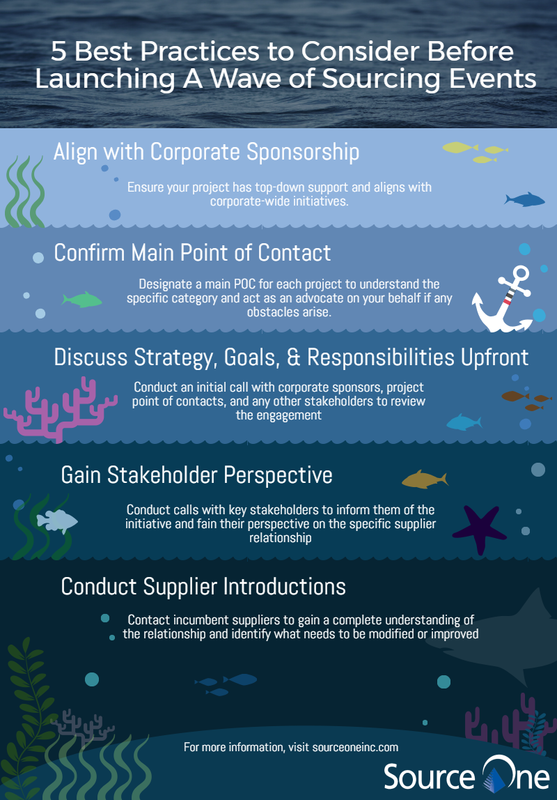 Are you prepared to launch your next wave of sourcing events? If you found this information insightful, visit Source One's website to learn more about our Strategic Sourcing Services and how our consultants can support your Sourcing and Procurement groups.